French criminal turned seminal criminologist Eugene Francois Vidocq on this date in 1806 witnessed the fate he might have shared when his former underworld collaborator went under the guillotine at Paris for murder. The son of an Arras baker, the young Vidocq (English Wikipedia entry | French) presented as an incipient Villonesque picaro. He had the first of his many theft-and-arrest events at the tender age of 13 courtesy of his father who summoned the gendarmes when he stole the family silver. Nothing daunted, Vidocq robbed the house again a few months later and ran away to join troupes of itinerant entertainers, soon transitioning into the French Revolution’s new citizen-army where the rogue by turns impressed with his competence and deserted ahead of some scandal, equally prolific in affairs of honor (he was an expert fencer) and those of the heart (same). While in prison for his latest misadventures in 1795-1796 he fell in with another inmate — our day’s principal, César Herbaux or Herbault — and forged a pardon order for one of their fellows. Vidocq, as we shall see, would always blame the others for inducing him (their story was the reverse). In either event, for their trouble they caught a sentence that was cruel even though “galleys” by this time just meant prison hulks. [And] the said Francois Vidocq and Cesar Herbaux shall be exposed for six hours on a scaffold, which whall be for that purpose erected on the public square of this commune. The sentence Vidocq himself published in his ghost-written memoirs, where the later, respectable man would situate it in the midst of his life’s chrysalis. I learnt … from the landlord of the inn at which I had put up, that the commissary of police had testified some regret at not having examined my papers; but what was deferred was not ended, and that at my next visit, he meant to pay me a visit. The information surprised me, for I must consequently have been in some way an object of suspicion. To go on might lead to danger, and I therefore returned to Paris, resolving not to make any other journeys, unless I could render less unfavourable the chances which combined against me. Here is the sentence of the criminal tribunal of the department of the Seine, which condemns to death the said Armand Saint Leger, an old sailor, born at Bayonne, and Cesar Herbaux, a freed galley-slave, born at Lille, accused and convicted of murder. I could doubt no longer; the wretch who had heaped so much misery on my head was about to suffer on the scaffold. Shall I confess that I felt a sentiment of joy, and yet I trembled? … It will not excite wonder, when I say that I ran with haste to the palace of justice to assure myself of the truth; it was not mid-day, and I had great trouble in reaching the grating, near which I fixed myself, waiting for the fatal moment. At last four o’clock struck, and the wicket opened. A man appeared first on the stage. It was Herbaux. His face was covered with a deadly paleness, whilst he affected a firmness which the convulsive workings of his featured belied. He pretended to talk to his companion, who was already incapacitated from hearing him. At the signal of departure, Herbaux, with a countenance into which he infused all the audacity he could force, gazed round on the crow, and his eye met mine. He started, and the blood rushed to his face. The procession passed on, and I remained as motionless as the bronze railings on which I was leaning; and I should probably have remained longer, if an inspector of the palace had not desired me to come away. Twenty minutes afterwards, a car, laden with a red basket, and escorted by the gendarme, was hurried over the Pont-au-Change, going towards the burial ground allotted for felons. Then, with an oppressed feeling at my heart, I went away, and regained my lodgings, full of sorrowful reflections. I have since learnt, that during his detention at the Bicetre, Herbaux had expressed his regret at having been instrumental in getting me condemned, when innocent. The crime which had brought this wretch to the scaffold was a murder committed, in company with Saint Leger, on a lady of the Place Dauphine. These two villains had obtained access to their victim under pretence of giving her tidings of her son, whom they said they had seen in the army. Although, in fact Herbaux’s execution could not have any direct influence over my situation, yet it alarmed me, and I was horror-struck at feeling that I had ever been in contact with such brigands, destined to the executioner’s arm: my remembrance revealed me to myself, and I blushed, as it were, in my own face. I sought to lose the recollection, and to lay down an impassable line of demarcation between the past and the present; for I saw but too plainly, that the future was dependent on the past; and I was the more wretched, as a police, who have not always due powers of discernment, would not permit me to forget myself. I saw myself again on the point of being snared like a deer. Forever abroad on a false passport, watching over his shoulder for the next inquisitive policeman, the next chance encounter with a bygone criminal acquaintance, Vidocq was in his early thirties now and aching to go straight lest he follow Herbaux’s path to the guillotine. At last in 1809 he was able to find the perfect port of entry for a man of his underworld expertise: policing. Beginning first as a snitch and informer, Vidocq uncovered a genius for the still-nascent field of professional law enforcement and made himself the field’s towering presence. His last arrest was in 1809; by 1812, he had created La Surete, France’s civil investigative organ. This still-extant entity became the model for Great Britain’s Scotland Yard (1829), with Vidocq consulting for his Anglo imitators. His subalterns were heavily lawbreakers like himself, men and also women recruited from the streets and prisons for whom the cant of outlaws was native tongue and who took readily to Vidocq’s training in disguise and subterfuge: Vidocq trafficked in information, seeking crime in its native habitat where the easy-to-spot predecessors to the beat cop could not penetrate. The payoffs in robbers ambushed red-handed and turncoats delightedly unmasking themselves made the man a sensation. 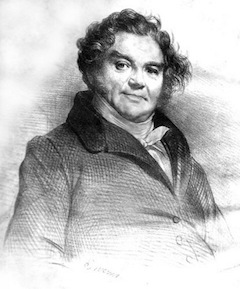 Yet alongside his swashbuckling flair, Vidocq’s prescient interest in then-novel police techniques ranging from forensic science to controlling crime scenes to logging permanent records about criminals have established him as either a or the father of criminology. All along, the master himself continued to adventure in the field too, and began compounding a sizable income from deploying his investigative talents for a private clientele. His mother who had once been accustomed to shelter him as a fugitive had a requiem mass at Notre Dame on her death in 1824. In 1833, retired from Surete, Vidocq founded perhaps the first private detective agency. But as had been the case while he was in public service he had a zest for skirting the edges of the legally or ethically permissible, which was eventually the ruin of his business and his fortune. For all his legendary charisma, his heirs at the Surete in the late 19th century all but wrote out of their institutional history the thief who literally wrote the book on their field. On this, the second day of the abortive 1832 June Rebellion in Paris, police inspector Javert is faux-executed — and mercifully released — by his longtime quarry Jean Valjean in Victor Hugo’s classic Les Miserables. 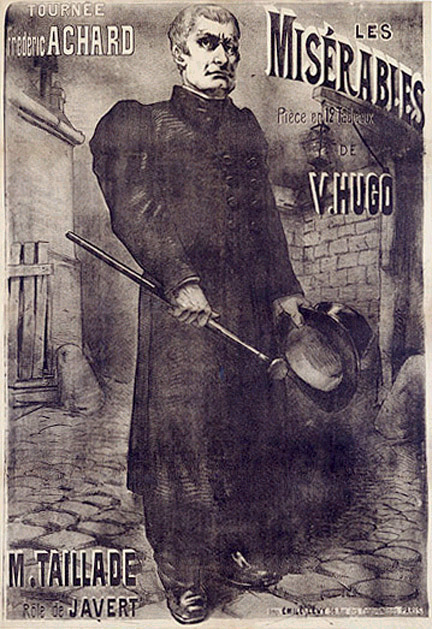 Javert depicted in an theatrical poster, from the Les Miserables Gallery. The site identifies this as an 1899 poster, which may be mistaken since the actor billed for Javert died in January 1898. Hugo’s monumental novel is structured by the implacable policeman’s pursuit of Jean Valjean, an absconded ex-con with a heart of gold. Fate brings them together accidentally at the barricade of the (historical, but now forgotten) student uprising — Javert to spy on the student revolutionaries, who unmask him, and Jean Valjean to keep an eye on his adoptive daughter’s idealistic lover. Jean Valjean’s timely contribution to the hopelessly outgunned revolutionaries gives him the pull to ask the favor of being the one to execute the spy. * Since Valjean has been hunted relentlessly by the lawman since breaking parole nearly two decades before, the hero has ample motivation to turn executioner. When Jean Valjean was left alone with Javert, he untied the rope which fastened the prisoner across the middle of the body, and the knot of which was under the table. After this he made him a sign to rise. Javert obeyed with that indefinable smile in which the supremacy of enchained authority is condensed. Jean Valjean took Javert by the martingale, as one would take a beast of burden by the breast-band, and, dragging the latter after him, emerged from the wine-shop slowly, because Javert, with his impeded limbs, could take only very short steps. Jean Valjean had the pistol in his hand. In this manner they crossed the inner trapezium of the barricade. The insurgents, all intent on the attack, which was imminent, had their backs turned to these two. Marius alone, stationed on one side, at the extreme left of the barricade, saw them pass. This group of victim and executioner was illuminated by the sepulchral light which he bore in his own soul. Jean Valjean with some difficulty, but without relaxing his hold for a single instant, made Javert, pinioned as he was, scale the little entrenchment in the Mondetour lane. When they had crossed this barrier, they found themselves alone in the lane. No one saw them. Jean Valjean drew from his pocket a knife, and opened it. Javert was not easily astonished. Still, master of himself though he was, he could not repress a start. He remained open-mouthed and motionless. “Be off with you,” said Jean Valjean. Javert retreated slowly. A moment later he turned the corner of the Rue des Precheurs. When Javert had disappeared, Jean Valjean fired his pistol in the air. In saving his own soul, Jean Valjean (conveniently!) manages to kill his pursuer just the same: the cognitive dissonance for such a hard, emotionless man being on the receiving end of this bit of redemptive mercy leads Javert to break character so far as to allow his man to escape. The inspector then commits suicide. Les Miserables is available free several places online, including Gutenberg.org and The Literature Network.